Izu hitomeguri gashi - One year of Izu in pictures and poetry. 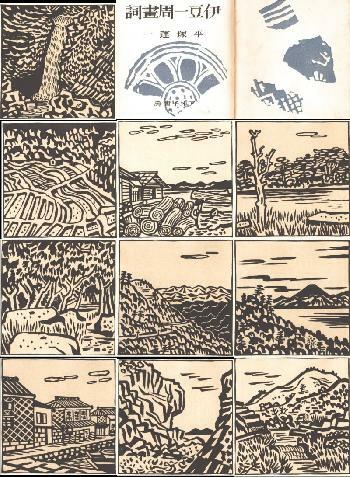 Set of ten woodblock prints, published as a kind of loose-leafed magazine in 1943. Each page is 20.8 x 26.5, and the size of each woodblock print is ca. 15.2 x 15.2 cm. Verso of each woodblock print is covered with text. Number 49 from an edition of 250. Very good impression, good condition; The condition of the ten prints is very good, but the edges of the cover and of a few prints are browned. The type of paper used is very prone to deterioration, so the condition of this set can still be called good. The photos are of a set I had more than ten years ago; please look at the separate photo of the cover (detail 1).